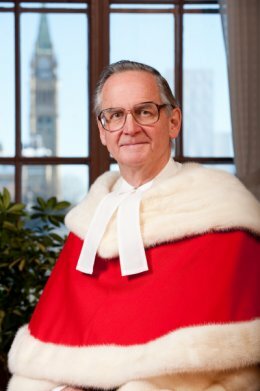 Justice Binnie was called to the English Bar in 1966, the Ontario Bar in 1967 and the Yukon Territory Bar in 1986. He was admitted to practice before the International Court of Justice in 1984 and obtained occasional calls to the Bars of British Columbia, Alberta, Saskatchewan, Manitoba and Newfoundland. He practised litigation at Wright & McTaggart and its successor firms until 1982, during which time he acted as legal counsel to the Government of Tanzania from 1970 to 1971. From 1982 to 1986, he was Associate Deputy Minister of Justice for Canada, and he was among counsel representing Canada before the International Court of Justice against the United States in the Gulf of Maine dispute in 1984. From 1986 to 1998, he was a senior partner at McCarthy Tétrault. In 1990, he acted as Special Parliamentary Counsel to the Joint Committee of the Senate and the House of Commons on the Meech Lake Accord, and in 1991, he was again a member of Canada's legal team before an international tribunal, against France, in the Saint-Pierre & Miquelon maritime boundary dispute. He appeared as counsel before the Supreme Court of Canada in many leading constitutional, civil and, occasionally, criminal cases. He also served as an advisor to the Government of Newfoundland on constitutional amendments to the Terms of Union, and as a part-time lecturer on aboriginal rights at Osgoode Hall Law School from 1975 to 1979, in addition to serving as a lecturer for the Law Society of Upper Canada, the Canadian Bar Association, The Advocates' Society and other professional associations. He was elected a Commissioner of the International Commission of Jurists in April 2003 and also chaired the Rhodes Scholarship Selection Committee from 1999 to 2004. He has authored numerous publications. In 1993, he was elected a Fellow of the American College of Trial Lawyers. He is a member of the Middle Temple Inns of Court (England) and an honorary member of the Commercial Bar Association (U.K.) and was Honorary Colonel of 426 Squadron, 8 Wing (Trenton) from 2004 to 2007. Justice Binnie was appointed Queen’s Counsel (Ontario) in 1979. He was appointed to the Supreme Court of Canada on January 8, 1998. Justice Binnie retired on October 21, 2011.